The killer seems to be playing a game and each time he is raising the stakes as he waits for the FBI’s finest to come out to play. From the first page I quickly became absorbed in this gripping thriller. I have not read any novels by this author previously, although reading good reviews about her was what prompted me to check out one of her books. 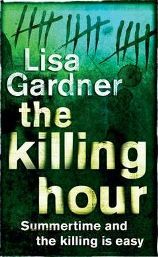 I am pleased I did after reading The Killing Hour. We are introduced to Kimberley Quincy, a rookie FBI agent who is training at the academy. Kimberley knows what it is like to lose someone and has been face to face with a killer herself when her mother and sister were murdered by someone she thought they could trust. Kimberley is trying to follow her father’s footsteps, as he once was a successful FBI profiler who now works independently alongside his partner Rainie, who is also his partner in his personal life. The problem with Kimberley, is following the death of her mother and sister she prefers to be an island. She feels she does not need anyone and prefers to be by herself, striving to become a successful FBI agent by pushing herself to the limit both physically and mentally during her training. She believes that is what is required and all that is needed, ignoring her supervisor’s concerns that she has made no friends or integrated well with her colleagues during her time at the academy. When concerns are raised, Kimberley refuses to acknowledge them and cannot see that her future role is about teamwork and that she needs to integrate and mix more with others. I found myself disliking Kimberley initially. Her headstrong arrogance was more than a little annoying, even though I had sympathy for her character for what she had been through. However, I think the author developed her character well throughout the book and we slowly see cracks appearing in the wall Kimberley has built around herself as the story unfolds. Reading on through the book, I came to like her character as we begin to see the real Kimberley and her vulnerable side slowly comes through. When Kimberley stumbles across the body of one of the dead girls in the grounds of the academy, she is instantly reminded of her dead sister and despite being told after her discovery that she has no part to play in the hunt for the killer apart from giving a statement, Kimberley thinks otherwise and circumstances lead to her teaming up with Special Agent ‘Mac’ McCormack to hunt down the killer after applying for leave from the academy claimimg ’emotional distress’ following her discovery of the girl’s body. Breaking all the rules, Kimberley risks her future career by disobeying orders to leave the investigation alone and is determined to carry on. Her father, a man who is still held in high regard by the FBI, is brought in as an independent body to work on the case also and whilst it was nice to see Kimberley and her father eventually begin to find each other again, I thought it somewhat unrealisitic how they came to ‘work’ together. Although overall I did find some aspects of the story unbelievable and a little absurd even, it was nonetheless a gripping read from start to finish and I simply enjoyed it for being just that. The plot becomes a race against time to find one of the victims alive and although I was correct with some of my predictions, there are one or two twists along the way which ensured that the reader cannot predict exactly how it will end, which is just how I like a good thriller to be. We get little glimpses of the killer during the book. Dubbed the ‘eco-killer’ because of notes sent to the newspapers saying ‘Clock ticking…planet dying…animals weeping…rivers screaming. Can’t you hear it? Heat kills…’ it is hard to decipher whether this is a man who believes he is on some sort of weird and deluded planet saving mission or just a vicious and deranged killer. I was quite surprised by the eventual conclusion. The relationship between Kimberley and Mac has all been done before and this was the most predictable part of the book. The chemistry and attraction between the couple is evident from their first meeting, although Kimberley is determined to fight against any possible attraction she has to Mac’s good looks and flirty personality, you just know sooner or later that something is bound to happen between them. Fortunately not much time is spent on their inevitable relationship. Written in the third person, the writing style is always interesting and whilst there is attention to detail regarding the various ‘ologists’ used to analyse rocks, leaves, water etc, it was never overly complicated. Everything was explained as simply and briefly as possible giving the reader just the right amount of information needed without ever becoming boring or heavy going. I found The Killing Hour an easy read and just the right length at 435 pages. It was quite hard to put it down after the first couple of chapters and it didn’t take me very long to finish reading it. If you enjoy a good thriller with a twist or two, then I can recommend this book. Despite it having one or two cliches and the plot becoming a little far fetched at times, it is still an engaging read that you can easily lose yourself in for a few hours. No Comments on "The Killing Hour"